The sad, tiny sweater upper back of lost hope--or is it? A few weeks ago, I was starting to lose all shrunken cardigan hope. 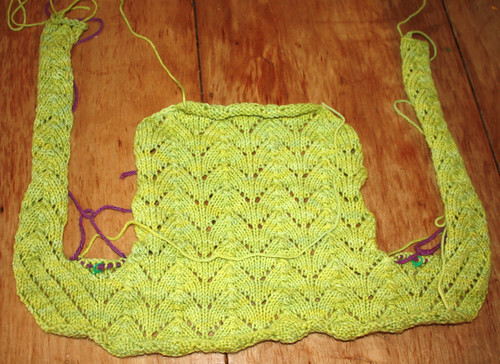 I had made decent progress in my odd moments on my lacy chartreuse Georgina sweater... but after the third time a coworker politely asked me at lunchtime if I was making another sweater for my daughter, I began to worry. Before starting the sweater I had carefully knit and blocked swatches in both plain knitting and lace to make sure I was getting Perfect Gauge, and I had followed the directions exactly. Yet when I held out the piece that should cover my shoulders and back, well... it did look rather toddler-sized. Enter the magic of blocking. I had always heard about this mystical wooly transformation, in which lace knitting enters a gentle magic bath and emerges damp and slightly smelling of sheep and stuck with carefully placed pins to expand to its full glorious potential. But while I've dutifully blocked everything I've knit, it never really seemed all that science-fictionally spectacular before. Sure I'd give my knits a gentle bath in tepid water and Eucalan, roll them in a towel to remove excess water, pin them to desired size until dry... and they always came out a bit neater and prettier, and maybe a bit bigger or smaller as desired (or not). THE END. OK, maybe you can't tell at all here, but it grew by over three inches in each direction. CARDIGAN CRISIS AVERTED--for now. So: for those of you who knit--have you been successful, or largely disappointed, in your blocking attempts? Blocking is magic: it is to knitting what pressing is to sewing -- it just smooths out all wrinkles and makes it look professional. Doubly so in colourwork or lace. 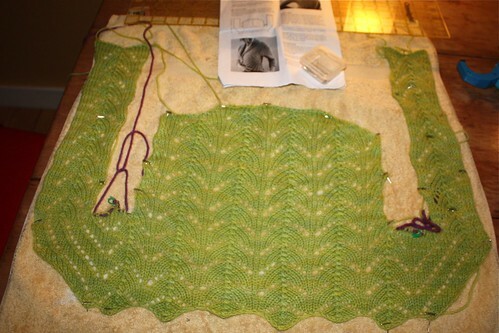 Blocking, especially with wool, can be magical! Especially with lace, as you observed. I've knit shawls that look like lumpy sacks of string, but once blocked they become ethereal and beautiful :) A fair isle hat I just finished went from too small to just right after blocking, and the stitches evened out. Magic! I'm so intrigued by knitting. It looks like it's going to be beautiful.